Heating, mixing and placing asphalt in various roofing and paving applications often exposes workers, residents and the general public to unpleasant odors. Complaints usually result, putting pressure on asphalt-based businesses to either relocate plants and terminals, or opt instead for non-asphaltic materials for various applications. Many of the odor-causing compounds emitted when working with asphalt, such as hydrogen sulfide and other sulfur-containing compounds, pose severe health risks, exacerbating odor concerns. 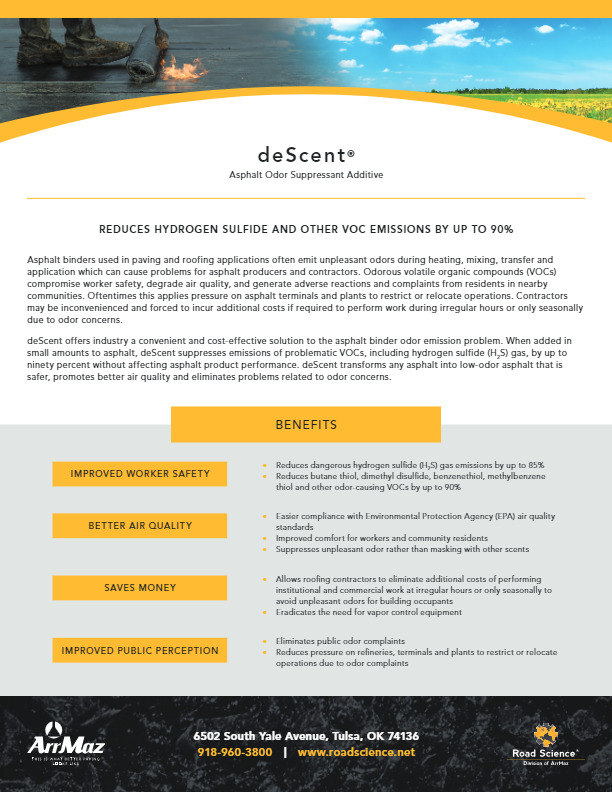 Road Science’s deScent® line of asphalt odor neutralizers works to suppress asphalt odors at their core and, unlike competing products, does not function simply as an odor masking agent. After deScent odor neutralizer is added to asphalt a dramatic reduction in asphalt smell is achieved. 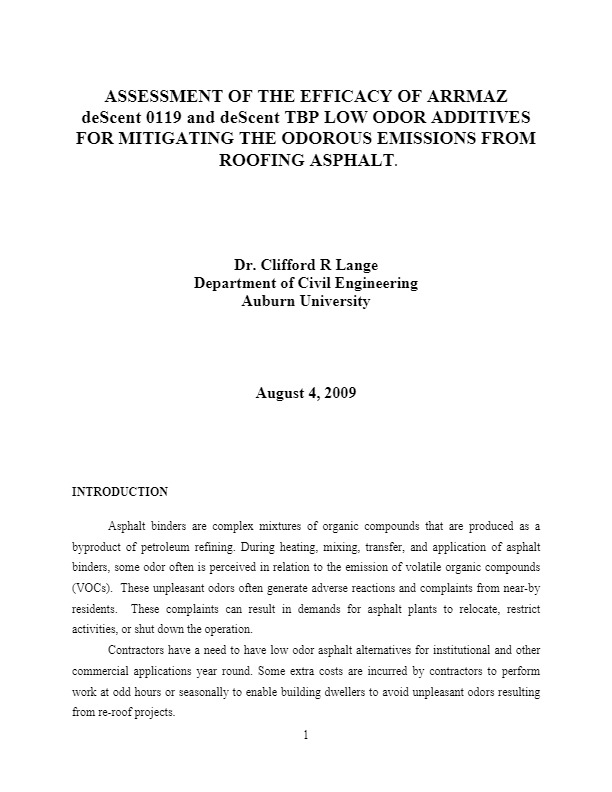 deScent also results in significant reductions in odorous volatile organic compound (VOC) emissions at asphalt temperatures commonly used in the roofing and paving industries. Using gas chromatography, deScent has been proven to reduce odorous VOC emissions in excess of 90%. 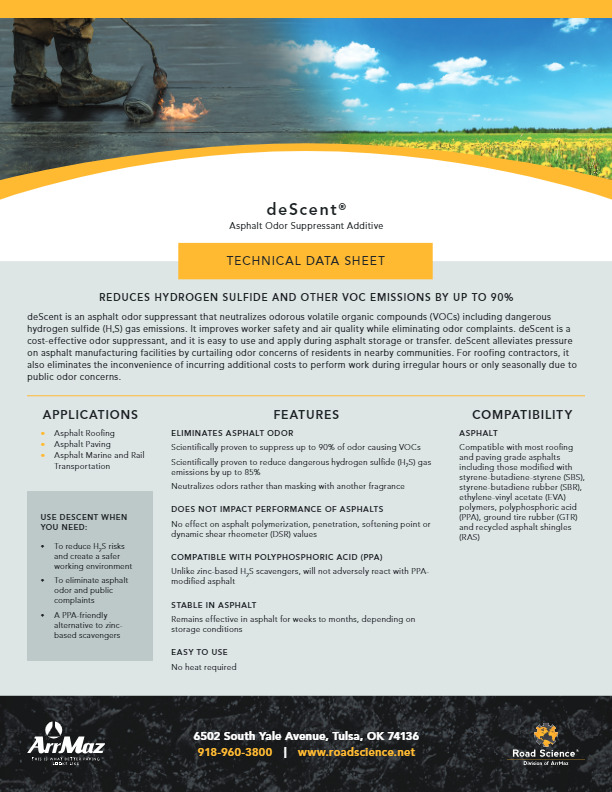 Unique to deScent is its effectiveness in reducing hydrogen sulfide emissions by greater than 85%, significantly exceeding the performance of competing products. Choose deScent asphalt odor neutralizers to reduce health risks, and improve comfort and safety for your workers and the communities in which you operate.